With Google Inc.’s Schemer app downloaded to your iPhone you’ll never be at a loss for something interesting and fun to do near you, and, more than likely, you’ll find yourself ready to travel, create, and explore. The Schemer iOS app brings together elements of Yelp, Pinterest, Snapguide, Facebook, and Google+ with straightforward functionality, but suffers from bland visual presence that undermines the successful content. The Schemer iOS social networking app syncs with your Google+ account and requires location services authorization to operate to its fullest potential. The authorizations and sign-in are quick, easy, and painless. You select categories like books, cocktails, home improvement, fashion, kid-friendly, and vacation. Virtually everyone will find something to get you scheming and sharing. Your preferred categories are then placed in the top of your “Schemes” list, but just below the option to check out schemes nearby or schemes for staying at home. When you want to check out schemes, you simply touch the category or location-based option to access many great ideas. The schemes listed in the Schemer social networking iPhone app lists are reminiscent of Facebook status updates recommending an activity, a Snapguide, Yelp reviews, and Pinterest inspiration. For each category, the default is to find schemes nearby, but it can be adjusted to anywhere with one touch on the bottom of the screen. The search option is very cool, so you can customize your search further. When you touch the search bar, a keyboard pops up, as well as a list of suggested searches like a standard Google search. You can also create a scheme by touching the icon at the right side of the search screen. You simply plug in what you want to do, add tags, and select your privacy level. The privacy is public or private, and it is activated with one touch. The one item I miss with the schemes is the lack of visual presence. You can’t link a photo or graphic for further inspiration and interest. Google images associated with the scheme are added instead of user-produced visuals. As with Google images, sometimes they’re cool, and sometimes they’re not. If schemers had the chance to add their own images, engagement and interest would certainly increase. Each Schemer iOS app scheme can be added to your list, marked as done, and receive comments. The scheme interface functions nicely, but lacks visually. There is a dark band at the top that would be a perfect place to put the fantastic Schemer iOS app mustache logo. You can mark that you want to do that scheme, and your face is added to the list of others who want to do the same. You can mark something as done. You can also add comments with efficient gesture controls. When someone wants to do your scheme, you become an inspiration to a fellow Schemer. You can share your schemes with Facebook, Twitter, and Google+. 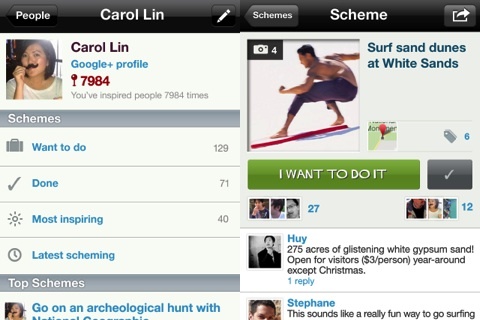 The Schemer social networking app for iPhone has a fun premise and is a great vehicle to drive Google+ traffic. It’s just missing a bit of the swagger you’d expect of a true Schemer. 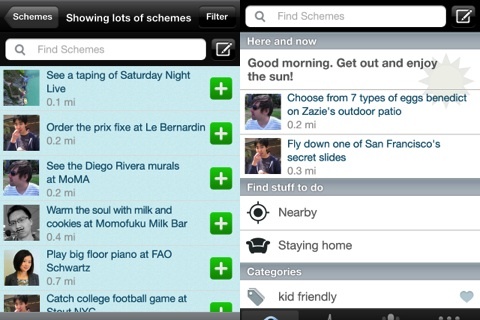 AppSafari review of Schemer was written by Jenni Ward on July 5th, 2012 and categorized under App Store, Food, Free, Kids, Social. Page viewed 3612 times, 1 so far today. Need help on using these apps? Please read the Help Page.